Nottingham Goose Fair dates back to 1284, when it was a trade fair known for selling exceptional cheese and thousands of geese. Today, squawking birds have made way for a more conventional fair of food stalls and rides. The anniversary of the Battle of Trafalgar is marked across Britain on Trafalgar Day. The battle saw the British, led by Horatio Nelson, triumph over the French and Spanish fleet off Cape Trafalgar in 1805. Celebrations include a ceremony in Birmingham and an event on board Portsmouth’s HMS Victory, the oldest commissioned warship in the world. The children of Hinton St George parade through the Somerset village with lanterns made of hollowed-out manglewurzel (an orange turnip-like vegetable) illuminated by a candle inside. Despite strong resemblances to Hallowe’en, the original Punkie Night lanterns were made, it is said, by village wives looking for their drunken husbands as they returned from nearby Chiselborough Fair. 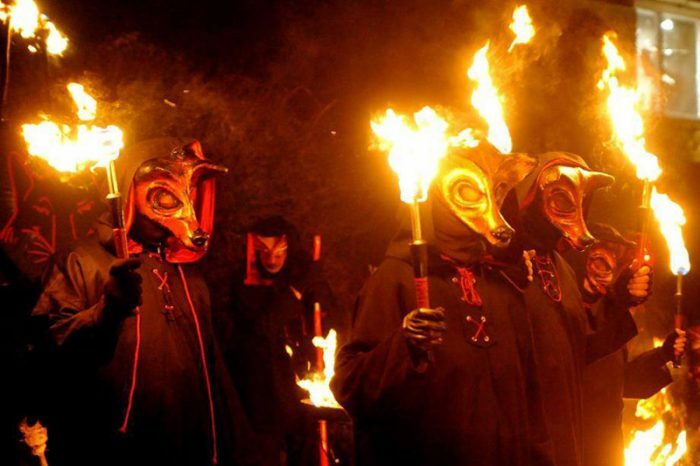 The Night of the Hunter’s Moon marks the legend of a drought and the strange discovery of the Red Book of Langsett, which was found in a lake and translated from Latin by the brother of Gunpowder Plotter Guy Fawkes. Mister Fox and his associates perform a rather mysterious masked fire dance in this Sheffield village in commemoration.